Breastfeeding During Breast Cancer - Safe or Not ? You are here: Home / Women's Health / Breastfeeding During Breast Cancer – Safe or Not ? Most of us know whether or not breastfeeding is safe before and after breast cancer, but what about while you have the disease. Is it OK to feed your baby during breast cancer? The first thought that springs to mind is a resounding ‘No’. After all, there are cancerous cells in the breast and that’s where the baby’s milk is coming from so how can it be safe, right? These are logical assumptions but they are not the whole truth. Let’s set your mind at ease immediately with this simple fact – you cannot infect your baby with cancer cells through breast milk. Phew! That’s a big relief right there. However, there may be other reasons that call for stopping breastfeeding while you have breast cancer. Discovering that you have breast cancer when you are breastfeeding does not automatically mean that you have to stop. Rather, that will depend on when exactly during breast cancer you want to breastfeed. 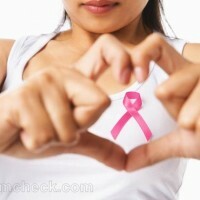 Have you just discovered that you have breast cancer? Does your doctor suspect it and are you still undergoing breast examinations and tests to find out for sure? Or are you already being treated for the disease? Let’s see whether or not it is safe under each of these conditions. You can safely continue breastfeeding while diagnostic tests are being done. However, your doctor may advise you differently based on your individual case. For example, the results of a mammogram – one of the tests to diagnose breast cancer – may be difficult to read if you are lactating. If the results of this test are inconclusive, you may have to stop breastfeeding for awhile so that the readings are more refined. As you can see, this reason to stop breastfeeding has nothing to do with the safety of the baby but rather with accurate diagnosis. Having breast cancer does not affect breast milk in any way. Cancer cells cannot pass on to your baby this way. So you can continue safely breastfeeding your baby until you and your doctor work out a treatment plan. If your doctor has advised chemotherapy as part of your breast cancer treatment plan, then you will have to stop breastfeeding completely while you are undergoing chemotherapy as well as for some time after. Chemotherapy exposes you to very high levels of radiation which will be passed on to your baby when you breastfeed. This is the only time, really, when breastfeeding during cancer is not safe. You will need to stop breastfeeding before you begin chemotherapy as the medicines you are required to take to prepare your body for the sessions are just as harmful as the radiation and will be passed on through your milk. You will also have to wait for some time after the chemotherapy treatment as well since the radiation will not leave your body immediately. It can be heartbreaking for a new mother to not be able to breastfeed her baby as she undergoes treatment. Breastfeeding is also a process of bonding for both mother and child and it is this that will be missed more than anything. Cuddle your baby close to your body while feeding him/her with a bottle. This can help you feel close to your baby and it can also make the baby feel safe and loved. If you have to stop breastfeeding during treatment, your breasts will stop producing milk after awhile. If you are keen on continuing to breastfeed your baby after the chemo is out of your system, then you will have to pump breast milk to keep your the supply of milk constant. You’ll have to throw away this milk, of course, as it is not safe for the baby. This way, at least you will be able to keep lactating and can resume breastfeeding when it is safe again.